All pets benefit from some variety in their diet – especially when it comes to hay. There a number of important benefits to providing a variety of grass hays. 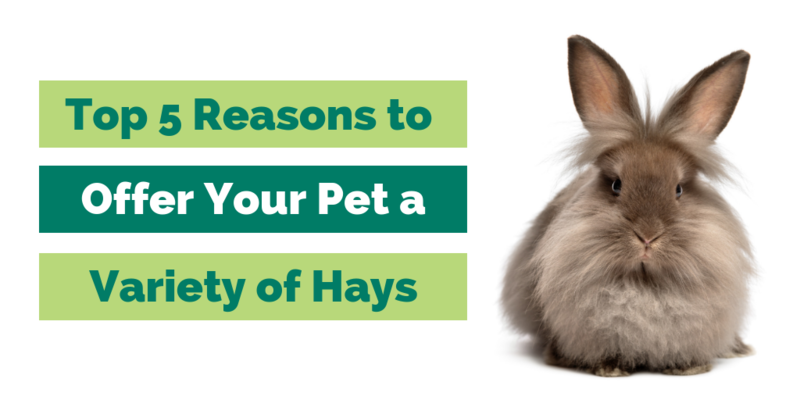 Here are the top five reasons to offer your pet a variety of hays. Access to a variety of tastes and textures expands your pet’s palate and helps him manage the natural variability that can occur between bags of hay. Fiber is key to your small herbivore’s health. Having access to multiple varieties of hay encourages consumption throughout the day, making sure your pet consumes enough fiber to stay healthy. Eating the same meal day after day gets boring! Offer multiple varieties to keep your pet active, mentally stimulated, and enriched. Offering your pet a variety of tastes and textures is fun for pet and pet parent alike. Experiment with different flavor combinations to help discover your pet’s favorites. In the wild, your pet would spend much of his day foraging for a variety of plant material. Offer multiple varieties of hay to encourage these healthy natural behaviors throughout the day. Hay – It’s Not Just For Herbivores! Hay is critical to the health and wellbeing of herbivores, but other pets benefit from this high fiber forage as well. Hay is a great source of physical enrichment for birds, hamsters, gerbils, rats, and other small pets. From bedding to burrowing to general exploring, these pets will benefit from access to hay in their daily routine. Hamsters and gerbils particularly enjoy oat hay, which often contains tasty, immature seed heads. Learn more about how to provide your pet with Nutritional Enrichment!